Following its debut in October 2010 at the EuroBlech machine-tool show in Germany, Amada’s FOL-F fiber-laser cutting machine now is available to metalformers. The machine reportedly boasts the fastest motion system available, combined with the world’s first 4000-W production fiber laser specifically designed for cutting. Featuring linear drives in the x, y and z axes, the FOL-F is engineered to provide 5G acceleration for the entire work envelope, and rapid traverse speeds in excess of 13,000 in./min. Cutting speed on some thin-gauge sheetmetal will be as much as 300 percent faster than possible with a CO2 laser. A single fiberoptic line delivers the beam directly to the cutting head without the use of mirrors in the laser source or in the beam delivery path, eliminating maintenance required for beam alignment and the costs associated with mirror replacement. Wall-plug efficiency is improved, and operating costs are reduced thanks to lower energy consumption and the elimination of the need for laser gas or optics. Due to the shortened wavelength of the fiber laser’s beam compared to a CO2 laser beam, the FOL-F can more readily cut challenging materials such as copper, brass and titanium. And, to optimize green-light on-time, the machine can be equipped with an optional eight-station changer that automatically changes, cleans and calibrates the nozzle and head based on the requirements of the workpiece material. WOW. Looks like a great piece of machinery! Thanks for sharing! 1500x3000mm ms. 8mm ,ss. 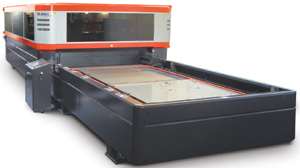 6mm cutting cnc fiber laser metal cutting machine technical and commercial details req.